To improve transformer oil, insulating oil dielectric strength, making less trace moisture content, gas content, dielectric loss factor and other indicators, before pumping transformer oil into the tank, a rigorous treatment must be proceeded by , that's the effective removal of the water, gas and impurities in the oil. 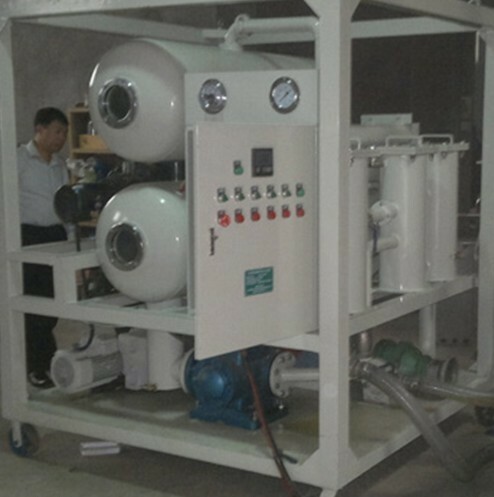 In practice applications, we have several different types of oil treatment equipments/ oil filter machines to complete the targeted treatment of transformer oil, insulating oil, results were better. 1. For the general transformer are impurities, water and dust contaminated transformer oil, Now generally vacuum oil purifiers (they are ZY Series Single stage vacuum transformer oil purifier, double-stage vacuum oil purifier series ZYD) are the best solutions. it can not only completely remove the water content, gas content, big size particles from the oil, but also can effectively remove small impurities. The process is: after dealing with coarse filtration of transformer oil through primary filter element, →→→ heating the transformer oil upto 50 ~ 60 degree, →→→ degasification and dehydration in the vacuum tank/separator absolutely, →→→remove smaller size particles through secondary filter, finally tiney fine impurities are also removed by fine filter, normally down to 1 ~ 5 microns. Transformer oil heating degassing vacuum dehydration. The principle is that the vacuum inside the vacuum chamber, the heating of transformer oil with the formation of oil mist spray approach (we called it Bi-infrared liquid Duplex 3D stereo-evaporation technology), making the gas content vaporized and water content vaporized as well, meanwahile most of water content was cooled down by condensor and removed through the water container. Oil Temperature is around 60 degree in general, not too high so as to prevent aging of transformer oil. This approach dehydration and degasification effect is better, is more commonly used methods. 2. Badly contaminated transformer oil filter/oil regeneration (Choose our BZ Series Oil Regeneration Device). Contaminated transformer oil (commonly known as dirty oil), is being mixed with very small impurities and oil molecules combine to form a colloidal contaminated transformer oil, and after years of used transformer oil, the general products release for the repairing/recovering of oil (This oil has a very low pH value). Of such waste oil must be used in order to improve the absorption approach to oil targets. Were more commonly used silica (SiO2) or activated alumina (Al2O3) as adsorbent. Waste oil processing system in order to ensure full access to silicone and transformer oil, and to facilitate replacement of silica gel, silica gel tank set up in a number of partitions, the silica gel into a small cloth bag within a rotation, not in bulk. After heating of the transformer oil into the gel tank, do a certain time cycle to its full absorption effect, and then injected into oil filteration tank. In the process of regeneration by silica gel, customer should be regularly monitor and determine the absorption effect. When this process effect is not obvious, replacement of silica gel need be taken into consideration. General silicone oil consumption by weight or about 3% ~ 5%. Waste oil processing system with the new oil processing system should be separated avoiding cross-contamination. Loading used waste oil cans, containers, etc... must be cleaned and dried thoroughly before used for the normal production of the oil system.